With Shun Nagare, KAI has created another innovative masterpiece of Japanese blacksmithing. The sophisticated design, the special properties of the materials used and a technically complex production process mean that this series of knives belongs to the absolute luxury class. On the highly polished blades, an ornately decorated, radial pattern of damascus layers is visible. 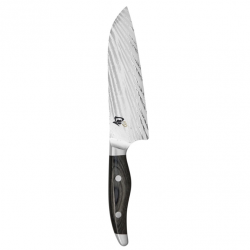 This effect, combined with the mottled grey-black handle, gives the knife an impressive overall appearance. The blade on the Kai Shun Nagare knives immediately draws the attention. It is consisted of two different types of steel - flexible VG2 steel and hard VG10-steel, which are bonded to a 72-layered piece of damascus steel, placed on each side og the blade (144 layers total). The complex layering of the two types of steel results in a blade with exceptionally sustainable cutting power. Innovatively forged and remarkably designed. As if the rays of a rising sun have been captured in the blade. An asset to any kitchen and a delight to work with! Small office knife. For shaping vegetables of all kinds. For cutting decorative ornaments, etc.Overa..
Utility knife.Overall length: 26.6 cmHandle length: 11.6 cmBlade length: 15 cmBlade:&.. Chef's knife.Overall length: 34 cmHandle length: 14 cmBlade length: 20 cmBlade: ..
Slicing knife.Overall length: 37 cmHandle length: 14 cmBlade length: 23 cmBlade: .. Bread knife.Overall length: 37 cmHandle length: 14 cmBlade length: 23 cmBlade: D..